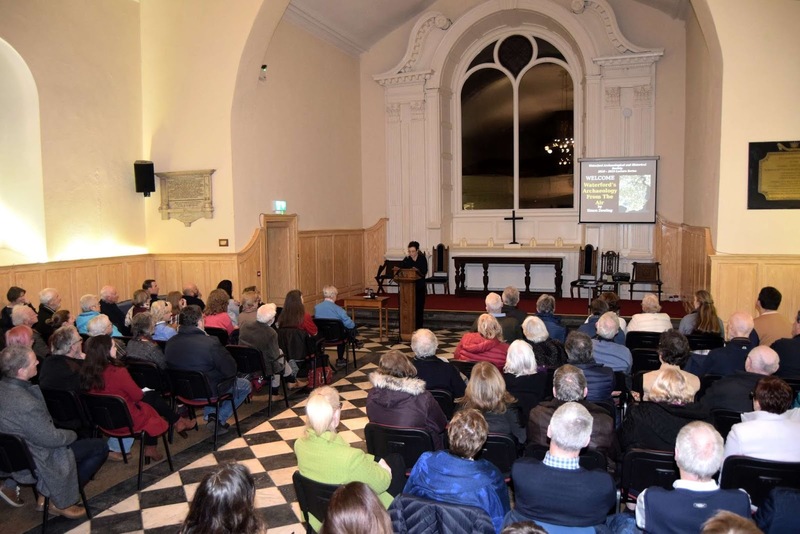 The Waterford Archaeological and Historical Society 2018 – 2019 lecture season continues on Friday March 1st with a lecture at 8 pm in St Patrick’s Gateway Centre, Waterford when Dr Louise Nugent will deliver a talk titled “Pilgrimage in Medieval Waterford”. Pilgrimage was a central part of life throughout the medieval period. It was practiced in Ireland from the 7th century to the 15th centuries and following the reformation it continued down to the present day. This lecture will explore what motivated people to go on pilgrimage to in Medieval Ireland, where they went and the various types of sites that were used for pilgrimage. It will have a particular focus on evidence relating to Waterford and the south-east. 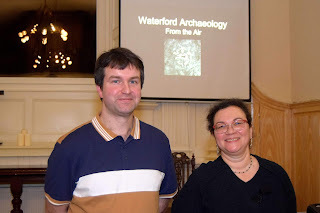 Lecturer Simon Dowling with Waterford Archaeological & Historical Society Chairperson Beatrice Payet. On January 25th, a full-house heard Waterford Archaeological & Historical Society member, Simon Dowling, deliver a fascinating and accessible lecture titled ‘Waterford’s Archaeology From the Air’. St. Patrick's Gateway Centre hosted the talk by Simon Dowling. Simon illustrated a variety of the aerial photographic techniques he has used and how he analyses publicly available satellite and laser imagery to reveal otherwise hidden aspects of many archaeological sites in Waterford. It was a well-received lecture which generated a lively discussion afterwards. The Waterford Archaeological and Historical Society lecture season for 2018 and 2019 continues on Friday 25th January with a lecture at 8 pm in St Patrick’s Gateway Centre, Waterford when Simon Dowling, a local pharmacist and committee member of the Waterford Archaeological and Historical Society, will share his passion for Waterford's rich archaeological heritage with his talk on, “Waterford's Archaeology From the Air”. Simon has spent a number of years photographing, scanning and analysing sites of archaeological interest around the county. The talk will showcase a virtual overview of Waterford’s archaeology that has been imprinted on the landscape across the county. Simon applies an aerial scanning technique called photogrammetry, a method which often reveals hidden details in the landscape which may otherwise be overlooked. He has been involved in a number of heritage projects across the county in this capacity and will share visualisations of the sites recorded. The Summer of 2018 also presented a special opportunity for airbourne photographers to record cropmarks and make new discoveries, and part of the talk will detail his endeavours in this respect. 2018 also saw the publication of an aerial laser survey (LIDAR) covering parts of the country, and he will give an overview of the different types of archaeological sites that this has brought to light across County Waterford. 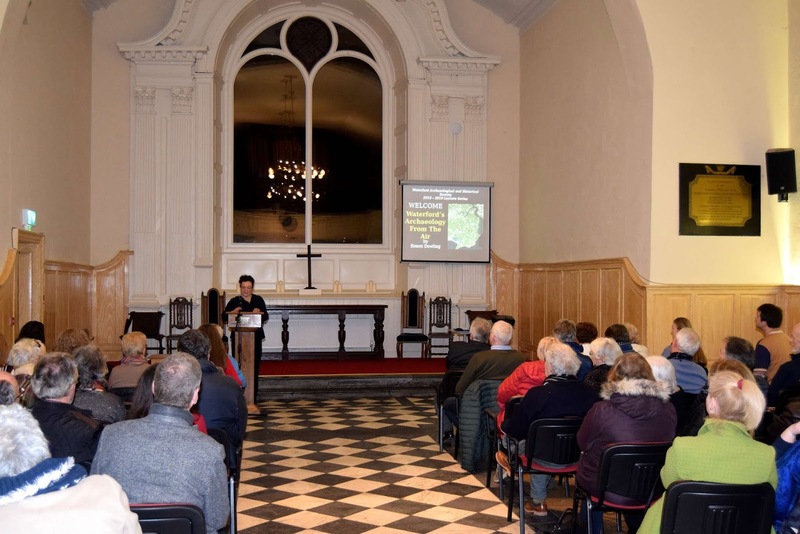 The talk aims to avoid much of the technical details and instead focus on presenting virtual visits to a variety of archaeological sites around the county. It should therefore be enjoyable and accessible for anyone with an interest in the County’s heritage.